SEAS the DAY!! WELCOME to the relaxed atmosphere and slow pace of life on 30-a!! 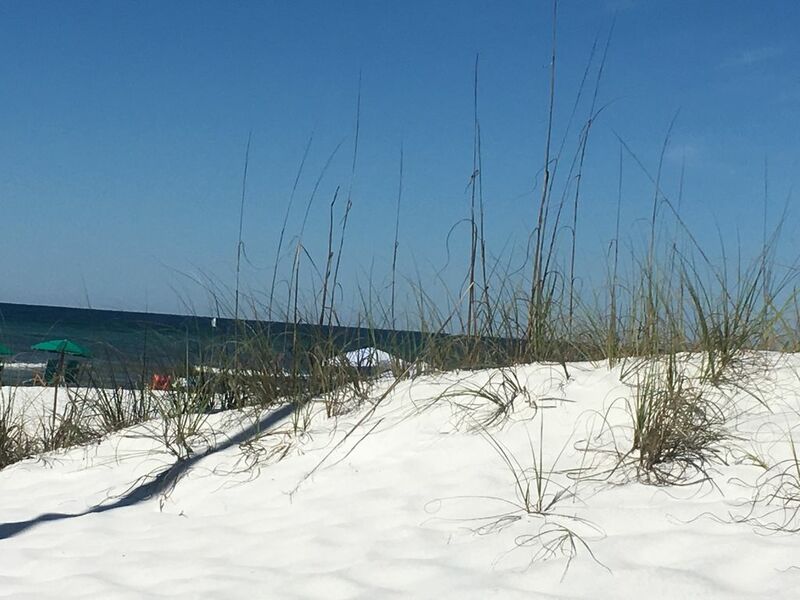 The Beaches of South Walton are absolutely beautiful and await your arrival! EASY BEACH access, NO ROADS to cross! We offer our CLEAN and UPDATED home to you to enjoy for nightly (3 night minimum), weekly or monthly rental. Located in Beachside Villas, this recently renovated and updated 2 BR/BA ground floor unit is ideally suited for couples or small families that are seeking to escape the crowds of the more populated Destin and Panama City Beach areas. King, 2 full beds, and a sofa. NO road to cross!! Our condo faces the beach, but as it is a ground floor unit you cannot see the gulf. We are in building 10, adjacent to the main pool. You will enjoy a nicely landscaped lawn that leads to a fence/privacy hedge directly off of the porch. The back porch is great for morning coffee and relaxing! Your walk will be an easy stroll (about 200 yards) to the boardwalk for immediate beach access. The boardwalk is FLAT- meaning you have only 2 steps down to sand versus several flights down to beach like many other access points locally. Our home offers a very comfortable living area, master bedroom w/ king bed, and a second bedroom with two full sized beds. Our comfortable living area boasts a leather recliner and comfortable sofa.. Master bath has tub and shower, second bath has a walk in shower. There is a full kitchen completely furnished with all utensils, dinnerware, and glassware. A blender, two coffee makers, and ice maker are also provided for your use as well as a full size washer and dryer for those long stays. TWO flat screen HDTV's (one w/ built-in DVD Player) and an LED SMART TV in living room for Netflix, Hulu, etc. Don't forget to enjoy your mornings and evenings on our private porch. Beachside Villas is ideally located away from the crowds BUT very close to so many of the activities that bring people back to this part of the Panhandle year after year. We mentioned the close proximity to Destin and Panama City Beach- SEASIDE is less than 5 minutes also. Many also enjoy exploring nearby Alys Beach, Rosemary Beach, and Grayton Beach. Check out The HUB on 30a!! Exactly 2 miles away and an easy walk or bike ride. This exciting new venue is very family friendly and hosts movie nights, live music, and great dining.. Come once and you will no doubt want to come again! We hope that you enjoy your stay in beautiful 30-A. Our family has been coming to Beachside Villas for many years and we've always felt at home here. The people are wonderful, the community is extremely safe, and the proximity to the beach is ideal. Few other communities offer as much value for your vacation dollar which is one of the many reasons that we continue to see the same people return year after year after year. We absolutely love it here and know that you will too! BEST beach access in the area. Such safe and easy access to both the beach and our two pools make hanging out with the family an absolute joy. Plenty of room for the kids to roam and play! Very close to Deer Lake State Park and Nature preserve AND Eastern Lake. Master bath has tub/shower, 2nd bath has a walk-in shower. Super easy walk and beach access. These are bath towels only- please supply your own beach/pool towels. Great for large gatherings and just hanging out! Direct access to 2 beautiful pools.. Main pool is heated in winter. Immediate access to 2 beautifully resurfaced pools (main pool is heated in Winter), tennis courts, and shuffleboard. While inside, please enjoy 3 wall mounted HDTV's, digital music (from CATV) and Bluetooth wireless speaker, and free Wi-Fi access property wide! We loved our stay at this property! It was close to everything and perfect for our family. The ground floor was convenient for the gear we brought. The amenities were so great; the heated pool and tennis courts were so nice to have close by. We were steps away from the beach and very close to the bike path, both of which we enjoyed. The property was clean and the beds were very comfortable. We would definitely stay at Seas the Day again! Thank you for a great stay! Thank you so much and we are glad y’all had such a pleasant stay! We had a wonderful time celebrating my husband's birthday with our best friends! The condo was exactly what we needed! It was super clean and tastefully decorated! The condo was just around the corner from the boardwalk to the beach! We stopped by the pool for a quick dip after the beach and it was super refreshing! So close to all our favorite restaurants! We especially enjoyed breakfast at the Perfect Pig. Thanks so much for sharing your place with us. We would definitely stay here again. We had a nice family vacation staying here. Condo was clean and tidy, quiet, and a very easy walk to the beach. The wagon was a life saver when taking kids and supplies to the beach. The only things that would make this place better are new boogie boards (all the ones in the closet are broken) and a drying rack! Most of the hooks outside are broken and we had bathing suits and towels for 4 to dry every day. A fold up drying rack would have been amazing. But that’s a small complaint and we had a great stay! The beach is just stunning here. We had a wonderful time. Had everything we needed. Clean and family friendly. Grandkids loved it. Property was very well kept. Easy access to beach. Family friendly area. Good parking spots. Great first time visit to Florida! This condo was clean, spacious, and had everything we needed for our weeklong stay! The umbrellas and beach chairs were so helpful! Thanks so much! Seas the Day was just the right place for us. Perfect size, beautifully decorated, all the amenities you need for a great beach vacation and just a short walk to a beautiful beach. Lots of wonderful restaurants and shops close by and the perfect spot for bike rides up and down 30A. Couldn't recommend Seas the Day enough! EASY beach and pool access with no roads to cross! Safe for kids to play. LESS than 5 minutes to historic Seaside where you will find a relaxing, family-friendly, small town experience like no other. Additionally, many have liked to visit and explore nearby Alys Beach, Rosemary Beach, WaterColor, Grayton Beach, The Hub on 30a, Panama City Beach, Destin and so much more! Our unit is directly across from a small fresh water lake in addition to the easy access to Eastern Lake for wide variety of fishing interests! Enjoy community restricted access to both swimming pools, a shuffleboard deck, and 2 lighted tennis courts! Please be reminded that our home is PET free and SMOKE free. Smoking is acceptable outside only and please be courteous when disposing of cigarettes to avoid possible penalties. Our home is spacious for it's size but please carefully review the bed space - for your comfort and enjoyment we do not recommend more than 4 adult guests.